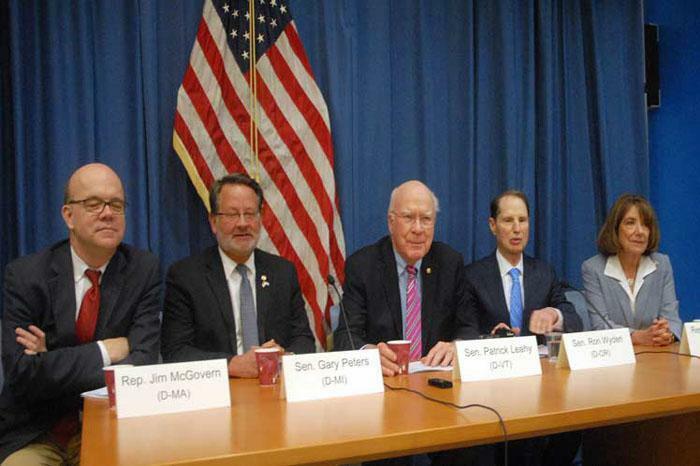 On February 15, Senator Leahy delivered a lengthy and persuasive speech on the Senate floor supporting this bill and ending the embargo. Here is the text of that speech. I concur in the rationale and conclusion of this speech: end the U.S. embargo of Cuba. While I believe there is valid documentation of the Senator’s assertion that Cuba has limits on free speech and assembly, he views this in isolation from Cuba’s situation. Cuba is a small country facing the vastly larger and more powerful U.S., which for many years has had various hostile policies and actions against Cuba, including secret and undercover so-called “democracy promotion” programs on the island. In that context, it should be easy to understand why Cuba is concerned about dissidents and free speech and assembly. Accordingly reliable U.S. assertions about the abolition of so called “democracy promotion” programs on the island should be a precondition to improving Cuban freedoms of speech and assembly. Senator Leahy, Statement of Senator Leahy On the Freedom To Export to Cuba Act (Feb. 15, 2019). The conclusion, however, is the same as previously reported: some U.S. personnel did suffer injury and the U.S. Government has publicly stated it does not know the cause or perpetrator of these injuries. But the article does provide greater details about many of the victims having been CIA agents and about the U.S.-Cuba interactions over these incidents. Entous & Anderson, Havana Syndrome, New Yorker at 34 (Nov. 19, 2018). See posts listed in the “U.S. Diplomats Medical Problems in Cuba, 2017-18” section of List of Posts to dwkcommentaries—Topical: CUBA. This August the Minnesota Orchestra will be in South Africa for concerts in five cities while previews were provided in concerts at its home in Minneapolis. There are at least three events that inspired this tour. The Cuba trip also demonstrated that this organization could respond quickly and competently to new opportunities. On December 17, 2014, Presidents Obama and Raúl Castro simultaneously announced that the two countries had started a process of normalizing their relations, and soon thereafter the Minnesota Orchestra announced that it would be going to Cuba in May 2015 for two concerts in Havana. This experience gave them confidence that they could tackle new opportunities and did not have to wait for larger, more prestigious orchestras to blaze paths. As Kevin Smith, the Orchestra’s outgoing CEO and President recently stated, the South African tour of five concerts in five cities over 11 days and nearly 9,000 miles from home and the integration of two choirs with different native languages in a country whose native languages probably were unknown to the Minnesotans was on “steroids” compared with the two back-to-back concerts in one city (Havana) over less than one week with only orchestral music and “only” 1,630 miles from home in a country whose native language (Spanish) was probably known to at least some of the Minnesotans. In 2014 in Pretoria, South Africa Music Director Vänskä conducted the South African National Youth Orchestra and said this experience was “a turning point in my life.” One reason for that impact was his learning that some of the musicians lived in tents and tin shacks and still loved music and could play at the highest level. When the Minnesota Orchestra visits that city this August he will lead side-by-side rehearsals with that same youth orchestra. He said, “It is a great experience when young musicians can sit next to the professional musicians and share these things.” In South Africa, he added, classical music is sometimes seen as being “for white people,” but he hopes this tour will reach the country’s black people too. In 2016-17 the Orchestra realized that 2018 would be the centennial of the birth of Nelson Mandela with many celebrations around the world, and the Orchestra people thought that such a tour would be another appropriate way of honoring Mandela. Turning the dream of a South African tour into a reality obviously required a lot of planning and financial resources. The financial support for this expensive project was provided by an anonymous couple and by the following nine major Minnesota-based companies or affiliates: Ecolab Foundation; Medtronic Foundation, TCF Financial Corporation; Land O’Lakes, Inc.; 3M Corporation; U.S. Bank; THOR Companies; Target Corporation; and Pentair. Some of the funds from the Medtronic Foundation will be used to buy concert tickets for less-fortunate South Africans and their children. See these posts to dwkcommentaries.com: Minnesota Orchestra Celebrates the Life of Nelson Mandela (July 24, 2018); Minnesota Orchestra’s “Celebrating Mandela at 100” Concert (July 29, 2018). Minnesota Orchestra, Program: Sommerfest 2018; Classical Movements, Minnesota Orchestra: Music for Mandela; Ross, Ode to Minnesotan and South African Joy, StarTribune (July 22, 2018); Ross, Packing instruments and loads of goodwill, StarTribune (July 5, 2018); Ross, South African tour represents ‘a new way’ for Minnesota Orchestra, StarTribune (Aug. 10, 2018); Ross, Another first for Minnesota Orchestra: A tour of South Africa, StarTribune (Aug. 10, 2018); Ross, Gallery: Minnesota Orchestra previews South African tour: ‘Music became a weapon against apartheid, StarTribune (Aug. 10, 2018); Ross, In a historic moment for Minnesota Orchestra, music echoes the words of Nelson Mandela, StarTribune (Aug. 13, 2018); Kerr, Minnesota orchestra hopes voices rise, walls fall on South Africa tour, classical MPR (Aug. 7, 2018). See thee posts to dwkcommentaries.com: Minnesota Orchestra To Go to Cuba (Feb. 13, 2015); Minnesota Orchestra Goes to Cuba This Week! (May 11, 2015); Minnesota Orchestra’s Trip to Cuba Garners National Recognition (Dec. 17, 2015). The confrontation of Presidents Donald Trump and Raúl Castro at the Summit of the Americas in Peru, as anticipated in a prior post, did not happen. Each of them cancelled his trip to the Summit. Instead Cuba sent its Foreign Minister, Bruno Rodriguez, while the U.S. sent Vice President Mike Pence, and the two of them exchanged verbal insults. The Secretary of the Organization of American States (OAS), Luis Almagro, also leveled criticism at Cuba. The Secretary General also urged those at the Summit to “continue to put pressure on the regime. Let’s not recognize the [Cuban] rules for succession that the dictatorship wants to impose on its people.” This was an endorsement of the call earlier in the week by about 30 former heads of state and government from Spain and Latin America who urged the governments at the Lima summit to refuse to recognize the new Cuba government that is scheduled to be appointed April 18 or 19. “It is a story of wars of conquest, dispossession of territories, invasions and military occupations, coups d’état and imposition of bloody dictatorships that assassinated, disappeared and tortured in the name of freedom; of rapacious plundering of our resources. What democracy and values ​​are spoken of here? Of those of President Lincoln or the “dream” of Martin Luther King , that would elevate the American people to whom indissoluble bonds unite us ?, Or of those of Cutting and of the supposed “anti-system” extremist conservative? On April 14, as the last scheduled speaker at the Summit, Vice President Mike Pence touched on many issues. He said the following about Cuba. Invoking the right of reply, Cuba Foreign Minister Rodríguez had these additional comments on April 14. Unfortunately these verbal skirmishes are to be expected in the Age of Trump at gatherings like the Summit. Now we all will see whether this week’s election of Cuba’s new President of the Council of State will lead to any changes in at least the rhetoric between the two countries. Also unfortunately most observers, including this blogger, do not anticipate any immediate changes. Torres, OAS secretary general: ‘We cannot allow the Cuban people to continue to be oppressed,’ Miami Herald (April 13, 2018). Bruno Rodríguez at Summit of the Americas: “Cuba will not accept threats or blackmail from the United States, CubaDebate (April 14, 2018). White House, Remarks by Vice President Pence at First Plenary Session of the Summit of the Americas (April 15, 2018); Mike Pence to Rosa María Payá: ‘We are with you for the freedom of the Cuba people,’ Diario de Cuba (April 14, 2018). Cuban foreign Minister: the US government cannot be a reference for Latin America, CubaDebate (April 15, 2018); The Cuban regime repeats its script in Lima: it says that “it will not negotiate anything or yield a millimeter, Diario de Cuba (April 14, 2018). On April 13-14, President Donald Trump will attend the Summit of the Americas in Lima, Peru, and on April 19 Cuba’s national legislature will elect a new President of the Council of State to succeed Raúl Castro. Both of these events will require Trump to comment on U.S. policies regarding Cuba, and already U.S. forces are proposing responses. Because of U.S. opposition, Cuba was not included in the first six such summits, 1994-2012, but in October 2014, the major countries of Latin America let it be known that Cuba no longer could be excluded from the next summit in April 2015. Therefore, when President Obama on December 17, 2014, announced that the U.S. and Cuba had agreed to commence a process of normalization, the U.S. abandoned its opposition to the inclusion of Cuba in such Summits. As a result, in April 2015 Cuba was included in the seventh such summit in Panama and Presidents Obama and Raúl Castro held a cordial meeting on that occasion. This year will be the eighth such summit, which are institutionalized gatherings of the heads of state and government of the Western Hemisphere where leaders discuss common policy issues, affirm shared values and commit to concerted actions at the national and regional level to address continuing and new challenges faced in the Americas. This year’s theme is Democratic Governance Against Corruption. On March 9, the White House announced that President Trump will attend the eighth Summit, where he likely will be met by hostile reactions to his Cuba policies as well as his anti-immigrant statements, proposal to build a wall on the Mexican border and tariff and other anti-free trade proposals and rhetoric. Mr. Raderstorf concludes by recommending that Trump “follow three simple guidelines: Listen first. Talk softly. And do your homework.” Will Trump be able to do that? We may be doubtful, but let us wait and find out. On March 11, over 8 million Cubans voted to elect 605 deputies for their national legislature (National Assembly of Peoples Power), and on April 19 those deputies will elected the country’s next President of the Council of State to succeed Raúl Castro. The widely assumed choice for this office is Miguel Diaz-Canel, who is now the First Vice President of Cuba. Any U.S. criticism of the Cuban process for electing its president of the Council of State seems particularly inappropriate. As we well know from the 2016 U.S. presidential election, U.S. citizens do not directly elect the U.S. president; instead they elect individuals to be members of the Electoral College who then elect the president. The 2016 election also is now under investigation for illegal interference by Russia, and the U.S. system is under constant legal challenge for the gerrymandering of congressional districts and for state laws that are designed to suppress voting instead of their purported purpose of preventing fraudulent voting. See the following posts to dwkcommentaries.com: Continued Bad News About U.S. Policies Regarding Cuba (Oct. 9, 2014); Comment: U.S. Now Willing To Accept Cuba at Summit of the Americas? (Oct. 9, 2014); U.S. Clarifies Positions on Cuba and Venezuela in Preparation for Summit of the Americas (April 8, 2015); Seventh Summit of the Americas Is Underway in Panama (April 9, 2015); President Obama’s Major Speech at the Summit of the Americas (April 16, 2015); Cuban President Raúl Castro’s Major Speech at the Summit of the Americas (April 17, 2015); Presidents Obama and Castro’s Meeting at the Summit of the Americas (April 18, 2015); Other Remarks by President Obama at the Seventh Summit of the Americas (April 19, 2015). OAS, Summits of the Americas. Assoc. Press, Trump to Attend Summit of the Americas Meeting in Peru, N.Y. Times (Mar. 9, 2018). Raderstorf, Can Trump Succeed at the Summit of the Americas?, N.Y. Times (Mar. 16, 2018). Londoño, Darlington & Politi, ‘World Upside Down’: As Trump Pushes Tariffs, Latin America Links Up, N.Y. Times (Mar. 18, 2018). Reinaldo, Rubio & Perez, Elections in Cuba: Elected 605 deputies to the National Assembly (+Infographics and Video), CubaDebate (Mar. 12, 2018); Cuba’s Elections, 2017-2018, dwkcommentaries.com (Nov. 29, 2017); Another Perspective on Cuba’s Current Elections, dwkcommentaries.com (Dec. 5, 2017). Press Release, Rubio, DeSantis Urge President Trump to Denounce Castro Successor (Mar. 9, 2018). 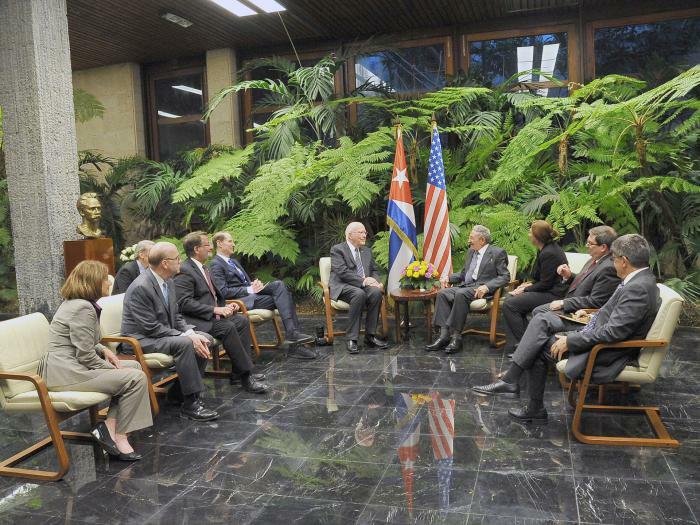 On February 20 they met with the Director General of the United States of the Cuban Foreign Ministry, Cárlos Fernández de Cossío. They discussed, among other topics, the medical problems of certain U.S. diplomats that occurred in Cuba. Cossío emphasized that there was no evidence of attacks on the diplomats and Cuba’s difficulties of carrying out a rigorous investigation. The delegation met with Cuban entrepreneurs who said Trump’s Cuba policy was hurting their businesses. Surprisingly there have been no reports that there was discussion of last year’s actions by the Cuban government to curtail the growth of the private sector or its new proposed regulations to impose even more onerous restrictions on that sector that apparently were leaked to the public the day after the delegation left the island as discussed in a prior post. An objective of the delegation was not met. They wanted to meet with Vice President Miguel Díaz-Canel, Castro’s presumed successor, but he was not available. At the conclusion of their trip, on February 21, the delegation held a press conference at the U.S. Embassy in Havana, and below is a photography of the delegation at this event. Moreover, according to Leahy, the Cuban government has been cooperating in trying to ascertain the cause of these medical problems and he believes the island’s authorities do not have the slightest intention to harm U.S. citizens who visit Havana. Indeed, not a single one of his colleagues had any fears about traveling to Cuba as they believe the island to be a safe place, and have even travelled here with their spouses, and in Leahy’s case, with his 13 year-old granddaughter. Leahy added that there are many American diplomats who want to work in Cuba despite the symptoms that Washington previously said affected 24 U.S. government officials and spouses. As a result, Leahy urged the State Department on Wednesday to restore embassy staff in Havana as soon as possible. Senator Wyden added that the delegation had stressed the importance for Cuba to unify its two currencies and “Cuba officials repeatedly said that this was the year to get it done.” Representative Castor subsequently added that the delegation asked the Cuban government to eliminate the 13 percent exchange tax on the U.S. dollar with respect to the CUC, the local convertible currency. The Cuban officials responded by saying “they would like to do that, but they have said that in the past,” said Castor. Press Release, Leahy To Lead Congressional Delegation To Cuba (Feb. 16, 2018); Delegation of the United States Congress Visits Cuba, CubaDebate (Feb. 18, 2018); Senator Leahy visits the MINREX headquarters in Havana, Martí (Feb. 20, 2018); Raúl received a delegation from United States Congress, Granma (Feb. 21, 2018); US congressmen criticize Trump’s turn toward politics as “erroneous and stupid,” Diario de Cuba (Feb. 21, 2018); US congressional delegation reaffirms need to improve relations with Cuba, Granma (Feb. 21, 2018); US Congressmen insist on the need to improve ties with Cuba, CubaDebate (Feb. 21, 2018); Assoc. Press, US Lawmakers Say It’s Time to Restore Staff at Cuba Embassy, N.Y. Times (Feb. 21, 2018); Marsh, Cuba tells U.S. delegation monetary unification on cards this year, Reuters (Feb. 21, 2018); Torres, Cuba shares plans for single currency and more during a visit by U.S. lawmakers, Miami Herald (Feb. 21, 2018). December 17, 2016 was the second anniversary of Presidents Obama and Castro’s joint announcement that their two countries had embarked on the path of normalization and reconciliation. The U.S. commemoration of this date was subdued. The White House held a small gathering that was not widely publicized .The Cuban government, on the other hand, apparently did not hold any such event. But two Cuban publications published sketchy comments on the anniversary. José Ramón Cabañas, the Cuban Ambassador in Washington. Also in attendance were U.S. Senator Patrick Leahy of Vermont and U.S. Representative Kathy Castor of Tampa, Florida, both Democrats. Rhodes and DeLaurentis touted the administration’s accomplishments and, at different times, got emotional — Rhodes remembering support from Cuban-American friends in the wake of stinging criticism over his work, and DeLaurentis describing his work in Cuba, where he began and might end his diplomatic career, as the most rewarding of his life. The attendees were Cuban Americans, Cuban government officials and business partners in Washington, including Miami entrepreneur Hugo Cancio, who publishes an arts magazine in Cuba; Felice Gorordo, founder of the Roots of Hope nonprofit; former U.S. Commerce Secretary Carlos Gutierrez; John McIntire, head of the Cuba Emprende Foundation; Miami attorney Ralph Patino; Giancarlo Sopo, founder of the CubaOne foundation, and Miami Foundation president and chief executive Javier Alberto Soto. Obama supporters at the meeting thought that Trump had a willingness to keep negotiating with Raúl Castro’s government and that U.S. regulatory changes, following a top-to-bottom policy review, could take time–so long, perhaps, that by then Castro might near his own retirement, scheduled for February 2018. No Cuban commemoration event was found in searching Cuban public sources, Instead, two articles on the subject were found. Nevertheless, the article stated, on December 7, 2016, Josefina Vidal of the Cuban government reaffirmed Cuba’s willingness to continue this process and expressed its hope that President-elect Donald Trump will take into account, when he takes office on January 20, what has been achieved” over the last two years. Obama had acknowledged for the first time that the U.S. policy of “aggression” [“hostility” would be more diplomatic] against Havana was a failure and had ended up isolating the U.S. itself. It also alleged that the U.S. methods were changing, but not its objective – regime change in Cuba. The U.S. still has a ban on US investment in Cuba, except in the area of telecommunications. The Cuban state sector, where more than 75% of the labor force is employed, remains deprived of selling its products to the U.S. with the sole exception of pharmaceuticals and biotechnology.Also, Cuban imports of goods produced in the U.S. that the state-owned enterprise can make are very restricted. Although several months ago the US approved the use of the U.S. Dollar by Cuba in its international transactions, it has not yet been possible to make deposits in cash or payments to third parties in that currency, due to international banks’ fears of fines by the U.S. The U.S. has not yet ended Radio and TV Marti programs aimed at Cuba. Mazzei & Torres, Muted White House celebration marks Obama Cuba anniversary, Miami Herald (Dec. 17, 2016). Lemmongello, Trump thanks Florida at Orlando rally, Orlando Sentinel (Dec. 116, 2016). Cuba-US: After two years, much remains to be done, CubaDebate (Dec. 17, 2016); Gomez, The keys of December 17, Granma (Dec. 16, 2016).